I took the 'T' today for the first time in about 12 years. 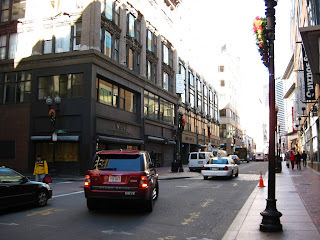 I had a little culture shock, but I got over it quickly (been in the 'burbs so long). I drove down to Forest Hills and took the Orange Line with Jessica this morning. It brought me back to the early '90s when I worked in an office on Temple Place, about a 40 pace walk from the BH Downtown Store, but I digress. 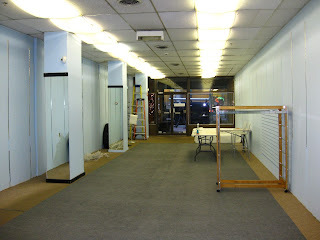 As promised, here is a view from the other side of the store. Sorry about the morning sun and the tall buildings. Not a good picture at all. But again, our shop is the one with the grate half open. Betsy met us at the space. While she put the finishing touches on the fabric covered lights, I took out all the long fluorescent bulbs in the windows (we have other lighting plans), and Jessica was on window washing duty. 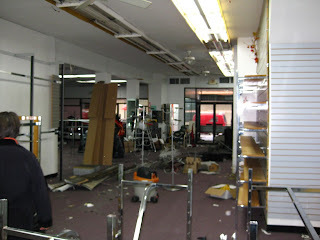 At noon, we went a short block down the street to meet with the owner of an empty storefront for some pillaging. The place was a disaster, but it had so much great display stuff just abandoned. I have only this one fuzzy picture of the mess, but Jessica took pictures of everything we were interested in, while I kept a list. We have our eye on some great stuff! We didn't have much time there, so we carried/rolled what we could back to the space today. Whoever is on the roster for tomorrow will be heading back to the disaster area to bring all the wonderful displays back to our space. 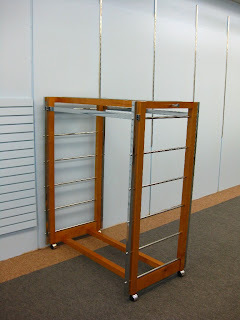 Here is one of four clothing racks that I think are going to be wonderful! 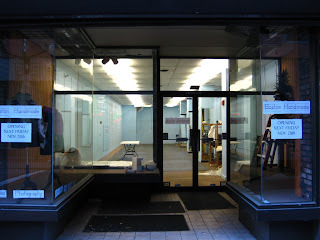 And a shot of the space as we left it. It's looking good! We also added some printed signage, so people know what's coming. wow- it is looking fantastic! All that after only two days of work! amazing! my god, look at you all! the space looks just brilliant and shiny! I can't wait to visit the shop and do some holiday shopping!